Even financial woes and a limited income can't stop you from creating real, sustainable wealth and the freedom it buys. The Millionaire Maker reveals Loral's proven wealth-building system that thousands of ordinary people have already used to begin a life of unlimited financial freedom. Ready to begin a new life of unlimited financial freedom? Read The Millionaire Maker and find out how to tap into the power from which great fortunes spring. There are only two things millionaires have that you don't: wealth and the knowledge to build wealth. But that's all about to change. 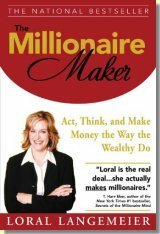 Thanks to "Millionaire Maker" Loral Langemeier, you can develop the same financial intelligence that millionaires use to create, grow, and sustain their fortunes. You'll also gain free access to many of the resources and investment advisors previously available only to those who sign up for Loral's world-famous Live Out Loud seminars and workshops.